A month ago (I know, a little late for this post) I was fortunate enough to be a part of a program called Math On The Move. 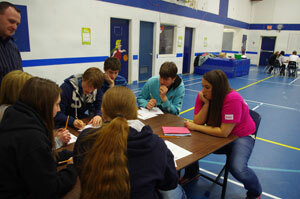 We planned math activities to do in small towns throughout Saskatchewan. I was hired to do this job through the University of Regina, along with four other math education students, and we created an afternoon (or morning) of math activities to take to small town schools. The idea of the program is so that smaller schools that are farther away from the University of Regina could be able to experience the benefits of the University and be open to activities they might not be able to do normally. Our afternoon was set up in an Olympic type competition, that awarded different amounts of points per team for different activities. We had four different activities. One station was a series of river crossing problems at different levels of difficulty. The second station had a sudoku on the ground which the students had to solve as a team. The third station was a bridge building activity with marshmallows and toothpicks and they had to be able to hold pennies on them. And the fourth activity, which was the activity I was in charge of, was die hard math. I played this video, from the movie Die Hard 3, and did the math problem prosed in the clip. If you have two jugs, a 5 L and a 3L, you have to make 4L using only the cups as measurements. You can’t guess and eyeball, you have only the two cups, and you can’t stick the cups into one another. I first saw this activity when I myself went to a math camp at the University of Regina with a group of grade eight students when I was in high school. I found it to really engage the students and also pushed their math skills. Every student from every town was able to answer this question, which was really exciting. The interesting thing about this problem is that you can do it in more than one way, so if they had trouble with the first way and I had to guide them through questioning to get the answer, they were able to do it the second way no problem. Many of the students hadn’t done many questions like this, and weren’t 100% comfortable just trying it out, but by the end of all the activities all the students were engaged. This program is so beneficial for small schools, and is something that I would be willing to do again and again.